St. Patrick’s Day, March 17, is traditionally known as a holiday with Irish roots and with green as the dominating color. A variety of merchandise, from socks to soap, comes out at this time of year sporting the St. Patrick’s green and related graphics. You can capitalize on this tradition by jazzing up your product’s packaging with some Irish green, some cloverleaves, and a cute little leprechaun or two. 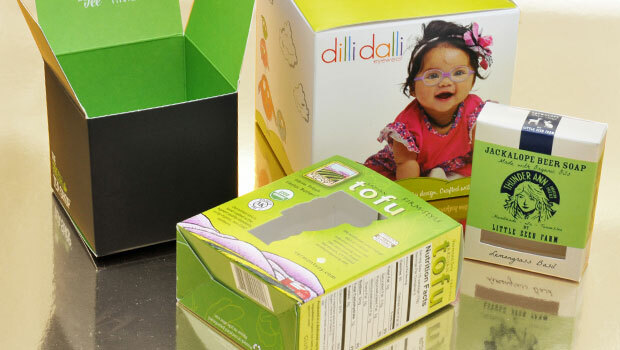 Whatever your product, whether it is food, clothing, toiletries, office supplies, or anything else, you can design its packaging with liberal splashes of green. Perhaps your product is of the type that the individual items sit in a shelf tray/box — something like bottles of school glue, individually wrapped candies, or maybe envelopes of bath salts. Our Double Wall Lid box is great for this application, and it can come printed to your specifications. Our printing department has just the right shade of Irish green for your packaging needs. In addition, if you have any of these boxes left over after the holiday, no problem — they fold flat for compact storage until next year! Three- and four-leaf clovers, leprechauns, and pots of gold are all are associated with St. Patrick’s Day. These can all be easily worked into your packaging designs. Our Hexagon box is the perfect choice for special treats or gift-type items. It lends itself to showcasing your product and your Irish spirit by utilizing the Irish colors and images. Another great way to show off your Irish is by using our Double Wall with Display Lid. This display box folds to hold your product and has a header as part of the box design. This can be printed with your St. Patrick’s Day design that will draw attention to your product. All our boxes can be printed to your specifications and with your graphic design. No in-house graphic designer? No problem! We can help with that, too. Our graphics department will work with you to come up with a St. Patrick’s Day design that will set off your products from the rest and show your company’s Irish spirit. The story of St. Patrick is a fascinating one. You can add a snippet of his story to your product’s packaging to add interest. If your product is such that it can be displayed in a clear plastic or cellophane bag, ourHeader Card is the perfect closure for it. There is plenty of room on the header for all your product’s information — name, company information, ingredients/contents, size, weight, etc. — and still have room for a brief description of who St. Patrick was. For information on St. Patrick, just do an Internet search, and you’ll find all you need. If you don’t see the type, size, or style of packaging that you need, please give us a call, and we’ll be happy to work with you to meet your needs.